Deck Coach: Craig Irving. Cost: $5 pp for weekday St. G's Masters Swimmers. $10 pp for all others. USMS membership required. Deck Coach: Connor Devers or Matt Emmert. Cost: $5 per person. USMS membership not required. Full results are listed below. Everyone must submit your yardage online by March 8. Do it now before you lose your split sheet. 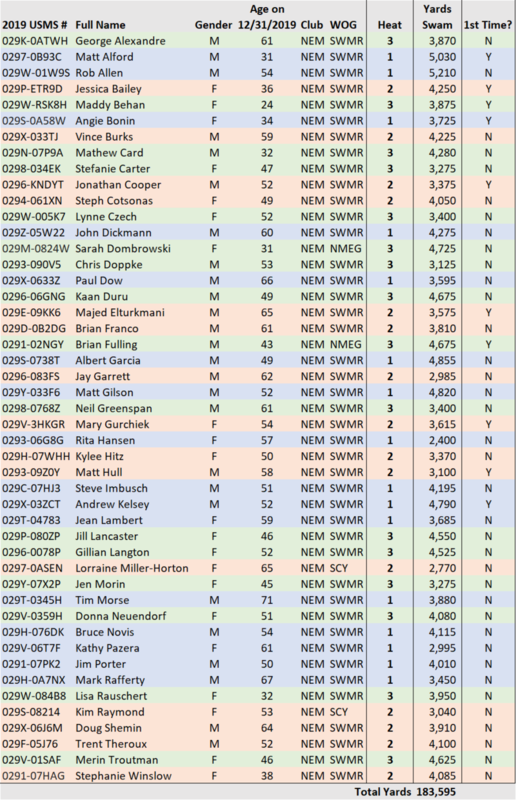 Every yard counts toward the New England Masters Swim Club (NEM) total! Trent Theroux's 1 x 4,000 individual medley! Fred Bartlett's South County Y swimmers. Everyone Fred trains beat last year's yardage total -- Kim Raymond, Lorraine Miller Horton, Rob Allen, Vince Burks. Connecticut swimmers. This Jon Caswell-coached contingent was both enthusiastic and impressive -- Merin, Sarah and Brian all handily surpassed 4,600 yards. Thanks to Coach Matt Emmert for hosting and the RWU college team for counting! ~25 people attended a fun post-swim lunch at Aidan's Pub. February 9th: Starts, Breakouts & IM Crossover Turn Clinic led by Coach Matt Emmert at RWU. March 16 & 22-24: "Harvard Meet" (NELMSC SCY Championship). The March 16th Distance Day cap is 200 swimmers and the overall meet cap is ~900 swimmers. March 1: Nomination deadline for NELMSC Appreciation Awards. 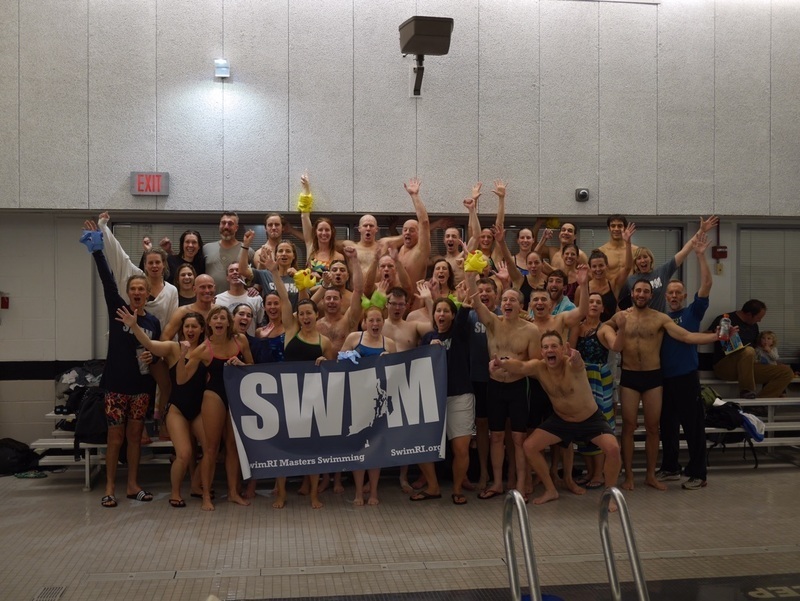 The SwimRI and South County Y workout groups are once again helping New England Masters Swim Club (NEM) defend its national club title in the two-month-long USMS 1-Hour ePostal National Championship by running organized heats for 2019 USMS-NEM members. This is a USMS-sanctioned participatory event. You may swim whatever stroke(s) you wish, at whatever pace you wish, continuously or with rest breaks. All participants must adhere to event rules during the swim and officially enter your results online after swimming. For past years' results, click here. To read about the long history of the 1-Hour Swim, click here. Check-in and warm-up open at 7:30am. Heats start at 8:15, 9:35 & 10:55. Minimum donation is $20 per swimmer (additional donations accepted). Proceeds go to the RWU swim team, in exchange for which the college team records splits for us. For more information contact douglas.sayles@swimri.org. As an added incentive, there will be a post-swim party at Aidan's Irish Pub where the winner of the total yardage betting pool will be announced. 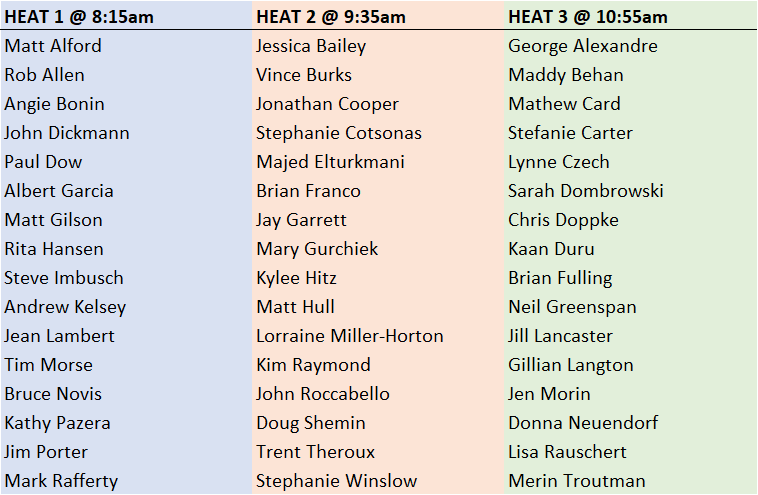 Each participant in the RWU heats will have the option to contribute $5 cash to the pot and guess the aggregate yardage of all three heats. To see last year's results, click here. South County Y workout group members are given priority. Other NEM members are welcome if/as space allows. Heats start at 8:10, 9:20 and 10:30am. Cost is ~$10-$12 per swimmer. Swimmers usually time/count for each other. A post-swim completion party is planned for 1pm at Turtle Soup Restaurant. For more info contact Fred Bartlett at swimtrirunman@aol.com. Can't join us on the above dates? Ask a coach or friend to time for you during January-February and submit your results online via the official event website by March 8th. Every yard counts toward NEM Swim Club's total! Join us August 16 & 17, 2019, at Lake Willoughby in Westmore, Vermont. This scenic venue is one of the most majestic and pristine glacially carved lakes in the Americas. USMS Sprint Distance (1 Mile) Open Water National Championship. Friday, August 16, 2019 – 1:00 PM @ South Beach on Lake Willoughby. USMS Long Distance (5 Mile) Open Water National Championship. Saturday, August 17, 2019. 100-swimmer cap. On Saturday participants gather at 8 am at North Beach on Willoughby Lake Road (Route 16) in the Town of Westmore. The organizers determine the most likely wind direction so as to swim with the wind; the race starts at 9 am from either North Beach or South Beach. Shuttle Service available between beaches. Both days include great competition, fun people, awards, music, food and more! Registration closes on August 1, 2019, or when the cap is reached. SwimRI's 7th Annual "Stuffies vs Steamers" Invitational Dual Meet and post-meet party will take place on Saturday, November 17, 2018 at Providence College's Taylor Natatorium in Providence, R.I. Warm-up is at 3:00 p.m., and the meet runs from 3:30 to ~5:30. Volunteer timers, spectators and hecklers are welcome! This event is a high-school-style dual meet where each of the 40 swimmers listed below competes in 1-2 individual events and 1-2 relays. Team lineups and meet sheets are determined by the captains -- Doug Sayles for Stuffies and Trent Theroux for Steamers. In most of the prior encounters, the last relay determined the victorious team. The series stands at 4-2 in the Stuffies favor. 200 Medley Relay (4 x 50), 50 Free, 200 Free, 200 IM, 200 Free Relay (4 x 50), 800 Free Relay (4 x 8 x 25), BREAK, 100 Fly, 100 Free, 400 Free, 100 Back, 100 Breast, Surprise Relay. The meet sheet will be posted on deck. The events are coed. There are a couple of twists, including the final "fun" relay. This year all swimmers must bring fins! Meet Fee: $20 per person payable at check-in. By tradition, the losing team buys the first round for the winners after the meet at Ladder 133 Sports Bar & Grill, 133 Douglas Avenue, Providence. Most people stay for dinner and some bring family/guests. Swimmers, please email douglas.sayles@swimri.org if you are bringing family/guests to dinner or if you are not staying for dinner. Coached practices Tuesday & Thursday 5:30-7:00pm at the six-lane, 25-meter John H. Chafee Pool. Base pass required. This group caters to DoD employees and their families, and includes some non-DoD civilians. To make arrangements for non-DoD civilians to get on base for swim practice contact mikegarr@msn.com or (401) 741-7193 or attend as the guest of someone with a base pass. Most of the coaches are USMS-certified and SwimRI members. Some swimmers are SwimRI members, most are not. 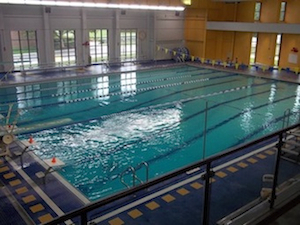 Written workouts are available to morning swimmers during lap swim hours without coaching or dedicated lanes. Click here to see all SwimRI Practice Locations & Schedules. April 29, 2018 -- Masters practices at Cumberland High School were canceled the past two weeks due to maintenance issues -- check the pool status with Coach Jeff Miksis at jmiksis@enviousswimming.com before attending. For the time being these Masters swimmers are going to Bryant University's Mon/Wed/Thursday practices from 5:15 to 6:30am. $5 drop-ins for USMS members.